I thought I’d use this article to talk about some of the ways to get kids cooking. Kids that learn how to cook, are much more likely to try new foods and be less picky eaters when they’ve made the food themselves. I’m lucky enough to get to cook with the kids at the school on a regular basis – and I have two kids of my own, who also have lots of friends, that like to play in the kitchen – so whether you’ve got your own kids home for the summer, or grand kids visiting – here are some ideas. 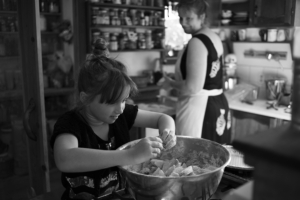 I have a few basic kitchen rules – wash your hands (can’t repeat this one enough) and when you are cooking with younger kids it also means no wearing bowls on heads and no licking measuring spoons (I’ve seen it all!) – while you are cooking – once you are done bowl helmets are just fine. I also try to keep long hair up – off the shoulders – use a hair band, or bandana. Get the kids involved in planning? Ask them what they’d like to make. When I’ve done this with small groups at the school, the answers have ranged from crepes to burgers, pizza to apple pie. I have yet to meet a kid with nothing they wanted to learn how to cook. So start there. What I do have kids say, is “I couldn’t do that”. But they can. I teach 5 year olds how to bake bread. They can do it – with help and support, but measuring, mixing, are all things they do in play – this is just doing it for real. When cooking with kids it helps to have all the ingredients you are going to need out on the counter before you begin, plus the measuring cups and spoons and any other equipment you will need. There are lots of recipe books designed for kids, or find a simple recipe online – print it out so that you can read through it together. When cooking, start at the beginning at go through slowly, step at a time. And sometimes you don’t need a recipe. One of my kids likes to “create” their own recipes. When the twins were four they learned how to melt chocolate chips in the microwave. Then they tried adding all kinds of things until they hit upon pecans – and “invented” chocolate covered nuts! Nothing beats the satisfaction of being able to bring your own food to the table, or your own plate of brownies to guests.